I have found a rather interesting website, Sparta reconsidered, and an associated blog. The site makes some good points, although it is, in my opinion, somewhat naive in its brief discussion of Spartan political structure. Also, while claiming that sources critical of Sparta were motivated by animosity, it ignores the fact that all contemporary literary sources – which are invariably aristocratic – have a positive bias toward Sparta. Pausanias, Guide to Greece, 2nd century AD. Xenophon, Spartan Society, 5th century BC. Thucydides, History of the Peloponnesian War, 5th century BC. The page contains a list of secondary literature as well. 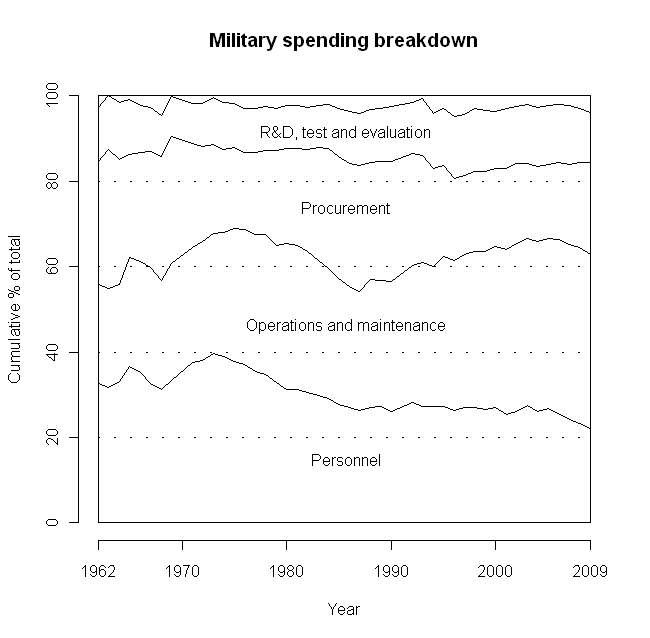 The share of military spending in the “personnel” category has dropped from around 40% in the early 70’s to around 20% today. The category that has grown most through that period has been “operations and maintenance”. Data source: Historical Tables Budget of the U.S. Government, Office of Management and Budget, Table 3.2—Outlays by Function and Subfunction: 1962–2014. The transition quarter in 1976 was omitted as well as the year 1991 in which the “other” category was -$46 billion (in most years it is on the order of +/-$2 billion).